An oak finished twin pedestal dressing table with a silky waxed finish. The Marlborough Twin Pedestal Dressing Table is suitable for any bedroom style. The Marlborough Twin Pedestal Dressing Table is made from a mixture of solid American white oak and high quality veneers and also has a waxed finish. 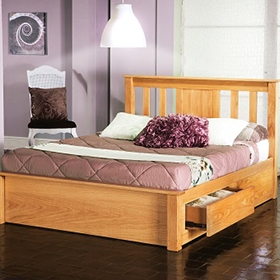 The Marlborough Bedroom Range features dovetail joints, chunky oak tops with a waxed finish, this range can also be used with the amsterdam beds. This Marlborough Dressing Table requires home assembly - contact us if service is required.